The Nutrimill grinds a wide variety of whole grains and beans including wheat, spelt, Kamut, quinoa, millet, oats, popcorn, lentils, rice, rye, triticale, buckwheat, pinto beans — basically any non-oily grain or seed. I had been baking bread for our family for at least 12 years before I discovered the HUGE nutritional advantages of freshly milled flour, and bought my own mill. Even now, I continue to be amazed at the night-and-day difference in the flavor of store bought vs. freshly milled flour — a bonus I hadn’t expected! Take a look at this article Getting the Most Out of Wheat to learn just how health-defeating it is to use store-bought flour. You’ll be amazed by the nutritional boost you’ll get from using freshly ground flour. There is a fairly large selection of grain mills on the market, and most have at least one major disadvantage. You can’t adjust the coarseness on some, others get the flour too hot, destroying important nutrients, some are so loud that you wouldn’t think of running them in your kitchen, and many are a nightmare to use and clean. We live out in the country, where nearly everyone makes their own bread, so before I bought my grain mill, I asked all my friends which mills they have used and which one is best. Outside of a one who liked the Whispermill (everyone else had negative comments about it), most recommended the Nutrimill. So that is what I bought. And I love it! **Update – I’ve used the Whispermill now, and I’d say it makes almost exactly the same amount of noise as the Nutrimill. What I didn’t like about it (Whispermill) is that it has a separate container for collecting flour, that you connect to the mill with a tube, it doesn’t hold as much grain as the Nutrimill, and you can’t start and stop it as you please (so when the phone rings in the middle of grinding, you can’t just turn the motor off like you can with the Nutrimill). 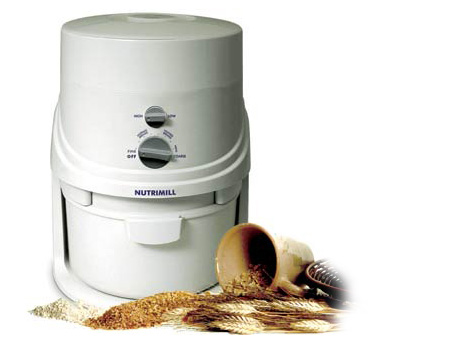 The Nutrimill is the most popular grain mill on the market, and for good reason. It makes perfect wholesome flour, quickly and easily, without the fuss of other grain mills. The Nutrimill has the best features and none of the drawbacks of other mills. Take a moment to watch our Nutrimill videos before you read on. They’ll open in another window so you won’t lose your place.. Maximum nutrition: The valuable nutrients in whole grains are protected by the Nutrimill’s low-temperature milling process. Unlike stone and friction grinders, the Nutrimill uses impact milling to keep the flour at about 118 degrees. It is the coolest-running impact mill on the market. Highly Adjustable: The Nutrimill has the ability to mill fine flour and can also be adjusted to produce medium or coarse flour for corn breads. Use the fine flour to make delicious breads with all the nutritional benefits of whole grains and the light fluffy texture of white breads. Straightforward design: Put your grain into the hopper on top of the mill, and the flour comes out into the container below. Simple as that. No connecting the motor to a separate container. Largest capacity electric grain mill: The Nutrimill quickly mills as much as 20 cups of flour at a time. And there is no need to measure out wheat; if the grain fits in the hopper, the finished flour will fit in the canister below. It really is wonderful! Versatile for multi grain and bean milling: You can use the Nutrimill to grind wheat, rye, millet, Kamut, spelt, quinoa, whole oats (groats), triticale, rice, popcorn, buckwheat, lentils, – basically any small non-oily grain. However, do not use it to grind coffee, large kernel field corn (small or medium kernel is okay), flax seeds, nuts, herbs, sesame seeds, or anything else that is oily, sticky or wet. Dust-free and easy to clean: The Nutrimill’s impact grinding mechanism is self-cleaning, so you never need to access the stainless steel inner parts. Any remaining flour dust can easily be vacuumed, rinsed or wiped off the canister for easy clean-up. And the Nutrimill runs dust-free — so milling flour won’t require extra housecleaning later! Manufacturer’s Lifetime Warranty: This impressive warranty includes the Nutrimill’s stainless steel milling heads! And the one time I did call, their customer service was great! And for warranty repairs, they are acclaimed to be the best in the business. There are several top notch appliances in my kitchen that I am very proud to own. And the Nutrimill is absolutely one of them. Caring for my family and my children’s health is vitally important to me. 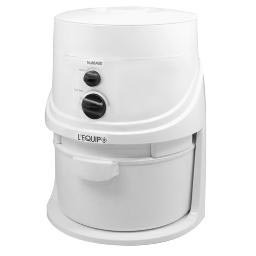 A Nutrimill that makes the job so simple and easy means so much! Fast, efficient, clean & ultra easy to use — it’s no surprise that the Nutrimill is the #1 choice of more whole grain enthusiasts than any other grain mill. Put this popular, lifetime-warranted mill to work making your baking more healthful & more fun! Just wanted to add a GREAT BIG THANK YOU for putting in the Maple Syrup for our order last Friday. I/We really appreciate the extra effort for that kindness. We tried the Grain Mill as per the instructions and it worked fantastic. I set it on fine and it pleased the little woman to no end. We made bread with the Soft White and it was so sweet like we had added sugar but didn’t. Wow! Are we going to have fun with this.